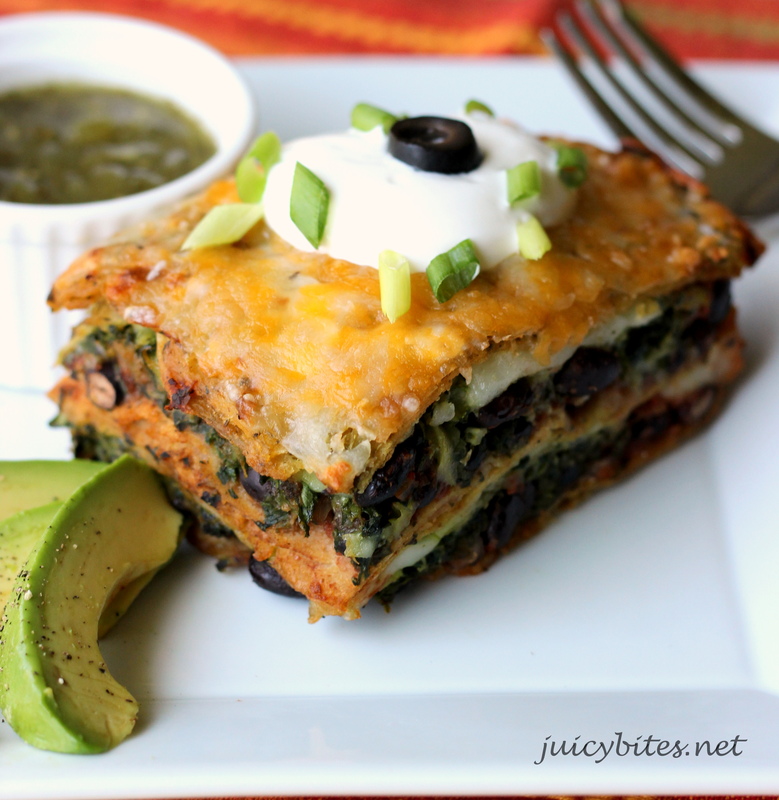 Get bold Mexican flavors and good-for-you veggies all in one simple dinner! I’m a sucker for a good casserole. There is just something about cooking a bunch of good ingredients in one dish that I really like. I love that I can sit with a glass of wine while it bakes in the oven rather than hustling around the kitchen right up until dinner is served. I also love that I almost always have left overs. I came across this recipe in one of my old-school binders filled with recipes that I have clipped from magazines. That was long before Pinterest :). This one was from Martha Stewart. I altered it a bit, but kept the same basic idea. This dish fulfilled all of my casserole dreams. I’m sure it will become one of my go-to dinners when I need something simple and tasty to feed the family. 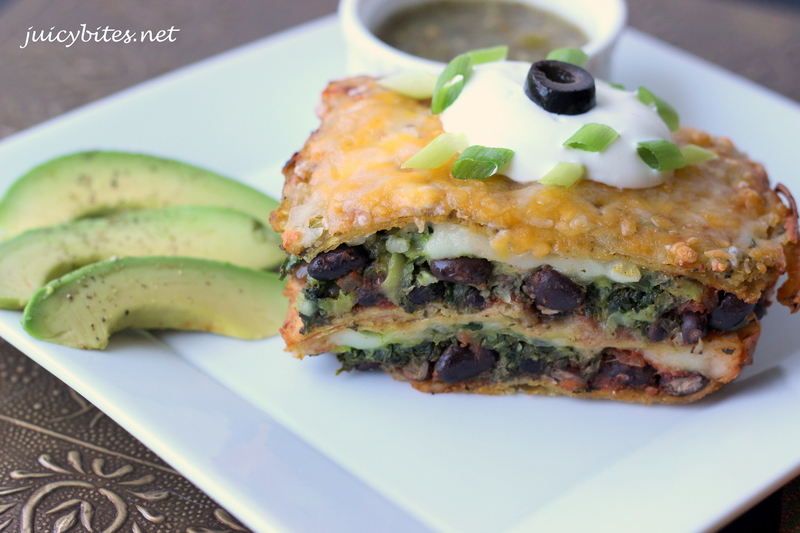 We all love Mexican food, and I love a meatless dinner that is still hearty and satisfying. A lot of Mexican meals tend to be light on veggies, but this one is filled with them. 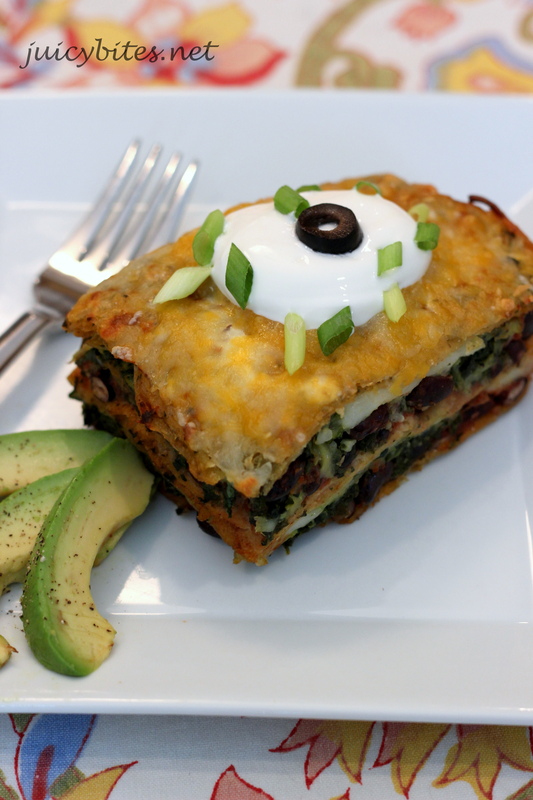 Layers of black beans, spinach, zucchini, queso fresco, and salsa are nestled between corn tortillas. The prep is pretty easy on this, just a little chopping here and sauteing there. The salsa is store bought, so no sauce to make. Just make sure you use a good salsa that you know you like. It is a big part of the flavor in this dish. I used a combo of red and green salsa because I didn’t have enough of either one. Either would be great, just go with what you prefer. Then…the oven does it’s magic. All of the yummy flavors meld together and the cheese gets bubbly. Of course you CAN’T forget the garnishes. Sour cream, olives, green onions, and avocado are my go to for many Mexican dishes. A little salsa on the side is great too if you have extra. Use a food processor to make quick work of your chopping – remove the tops of the cilantro (you want mostly leaves and minimal stems) and add them to the food processor (save a little to garnish if you like). Cut the green onions into 1 inch pieces and throw them in with the cilantro. Add the garlic cloves and pulse until chopped small. Add the spinach and pulse a few more times to roughly chop. In a large frying pan, heat a couple tablespoons of olive oil over medium heat. Saute the grated zucchini for a few minutes until the liquid cooks off. Add the spinach, cilantro, green onion and garlic from the food processor and saute a few more minutes. You want most of the veggies’ liquid to cook off. Spray the bottom of a large casserole dish (I used an oval 11″ x 9″ CorningWare dish) with non-stick spray (or coat with a little oil). Layer 4 of the corn tortillas on the bottom (Cut them in half if you need to in order to cover the dish). The tortillas will overlap. Add half of the black beans to the tortilla layer, then add half of the veggie mixture, next add one cup of salsa, then one cup of the crumbled queso fresco cheese. Add the next layer of 4 tortillas, then the rest of the beans, veggies, another cup of salsa, and the rest of the queso fresco. Finish with the last layer of 4 tortillas, the last cup of salsa then top with the shredded cheese. Cover with foil and bake for about 30 minutes. Take the foil off and bake another 5 to 10 minutes. 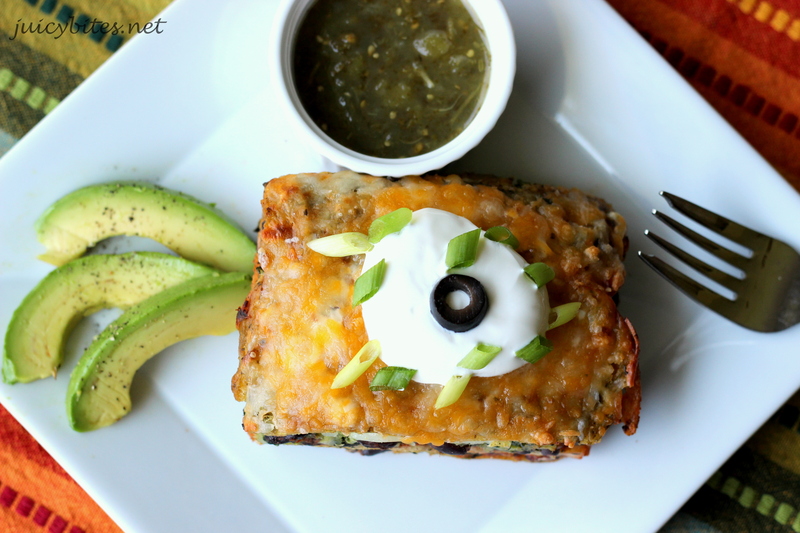 Let cool for about 10 minutes to set and serve topped with sour cream, olives, diced avocado, cilantro and green onions. question, if one wanted to add ground beef to it, how would you incorporate that? maybe use some traditional mexican seasoning instead of pre-packaged taco seasoning and add a little in each layer? I have organic ground beef out thawing and this seems like the perfect casserole! I have made this casserole with ground beef too, and it’s delicious! I scale back on the veggies when I do it that way and usually serve it with a salad on the side, but you can keep all the veggies in if you want. I hate to dirty too many pots and pans when I cook, so I would brown the beef in a large frying pan, drain any excess fatt off, then add about a teaspoon of cumin, salt and pepper to taste, and then I would throw any veggies I’m using right in with the beef, saute them for a bit, and make that one layer. All of the veggies would be great, but don’t skip the garlic, onion, or cilantro since those add such good flavor. You could use a little packaged taco seasoning in the beef if you want instead of cumin/salt/pepper. I use them now and then as long as they are MSG free and just contain seasoning/spices. Just use less…maybe half the package. You get a lot of flavor from the salsa and you wouldn’t want that taco-y flavor to over power the dish. I made this for my family, and we all LOVED IT!!! Such a wonderful blend of flavors!! And the food processor made everything so easy. Thank you so much for sharing this wonderful recipe, we will definitely be making this again! Your Welcome, Natasha! So glad you and your family enjoyed it!